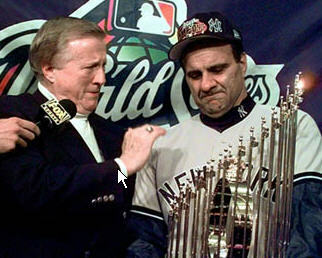 George Steinbrenner (l.) celebrates a World Series victory with longtime ASA member and Yankees manager Joe Torre. George Steinbrenner, whose thirst for winning gained him infamy as Yankees owner, died Tuesday, the team confirmed, after suffering a massive heart attack at his Tampa home. He was 80 years old. "He was an incredible and charitable man. First and foremost, he was devoted to his entire family -- his beloved wife, Joan; his sisters, Susan Norpell and Judy Kamm, his children, Hank, Jennifer, Jessica and Hal; and all of his grandchildren," the Steinbrenner family said in a statement. "He was a visionary and a giant in the world of sports. He took a great but struggling franchise and turned it into a champion again." Steinbrenner leaves a bombastic legacy, gleaned not only from collecting titles but also from spending money, and firing people. "He wanted to win above everything else -- and that was not only in baseball but everything else," Steinbrenner's longtime friend Leonard Levy told the Tampa Tribune. Steinbrenner, heir to a Cleveland shipbuilding company, bought the Yankees in January 1973 from CBS for $8.7 million. The once-proud franchise had sunk to the second division, but Steinbrenner used the new avenue of free agency to add stars to his roster. Under Steinbrenner, the Yankees won the World Series in 1977-78, 1996, 1998-2000 and 2009. But in addition to the championships, he was also famously short-tempered, hiring and firing manager Billy Martin five times. Steinbrenner canned Yogi Berra 16 games into the 1985 season and, in his heyday, called out players -- even Derek Jeter -- and managers openly. Perhaps the temperamental and demanding personality was honed by a military academy education and experience as an assistant football coach at Northwestern and Purdue. Not long into his ownership, a New York tabloid coined the nickname "The Boss," and it not only stuck, but Steinbrenner liked it. In 1990, Steinbrenner was banned from day-to-day operations by commissioner Fay Vincent because he paid gambler Howie Spira $40,000 in an attempt to get dirt on star player Dave Winfield. In 1974, Steinbrenner had pleaded guilty to conspiracy to making illegal campaign contributions in the 1972 presidential election. By 1994, Steinbrenner had become a character on the popular TV show, "Seinfeld," with show co-creator Larry David lampooning The Boss. After the Yankees ended a 13-year playoff drought in 1995, and the team was celebrating its wild-card berth, Steinbrenner told the manager and coaching staff they had better win the World Series or they'd all be fired. They didn't, and so they were. Steinbrenner then hired Joe Torre as manager, and he immediately won three World Series in four years, restoring the pinstriped dynasty. That led to another innovation: the YES Network, which set the standard for team-owned cable stations. With even more revenue, the Yankees outspent all other teams by a wide margin. Baseball's luxury tax was designed mostly to slow Yankees spending, although it barely did. But after the dynasty years of 1996-2001, Steinbrenner-endorsed infighting -- he created New York and Tampa, Fla., factions by splitting up the team's front office -- led to poor decisions. By the mid-2000s, Steinbrenner's health was fading. He collapsed at a December 2003 memorial service for football great Otto Graham and had another fainting episode in October 2006. By then he had faded from public view almost entirely. As Steinbrenner withdrew from decision-making, general manager Brian Cashman gained control, and the team returned to the top in 2009 -- the first season in a new stadium, a $1 billion-plus palace which was Steinbrenner's final achievement. The initial season was capped with another World Series title, the franchise's 27th, and the seventh of Steinbrenner's reign.